My colleagues believe that the most animated I’ve been all week was when explaining to them what the portholes in the walls are for. Basically, when theatres and arenas used to be built, they tried to bury enough cabling in the walls to satisfy all the end users. In older theatres this is much more of a problem since the technical parts of stagecraft have changed so much in the last years. In more recent buildings like this – and in particular versatile multi-use buildings which take on a lot of touring shows using their own equipment, it simply isn’t possible to predict what sort of cabling might be necessary and bury it all in the walls at construction for a building that will hopefully have a life of 30-50 years. 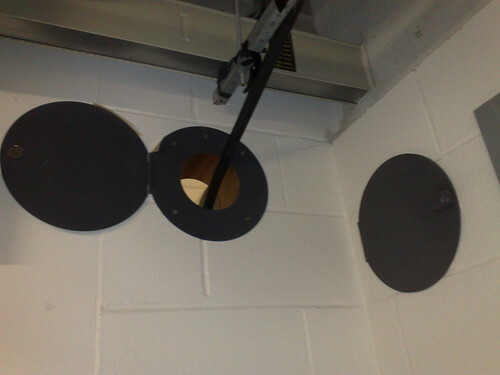 So instead they make it as easy as possible for incoming technical teams to recable the building the best they can, by making sure there are these portholes running through the building. There are also suitable cable supports between the portholes to hold the weight of a ton of multicore after it’s brought in. well I never, now I know….. I did wonder.